Nico Rosberg extended his lead at the top of the drivers' championship with a measured victory over team-mate Lewis Hamilton at the Austrian Grand Prix. Shock: Sergio Perez's drive from 16th to sixth was a superb effort from the Mexican, managing each tyre phase perfectly to make up for his last-lap disappointment from Canada. Shocker: Sebastian Vettel's bad luck returning once again, losing drive on the opening lap as Red Bull's homecoming went up in smoke early on, capping a weekend which saw it woefully off the pace from the get-go. Best overtake: Daniel Ricciardo's last-lap pass on Nico Hulkenberg saved some face for Red Bull. Best lap: Lewis Hamilton needed a strong start off the line from ninth and he got one, jumping both Kimi Raikkonen and Daniil Kvyat off the line and ending the lap behind Nico Rosberg in fourth. Worst lap: Felipe Massa's hopes of a podium vanished on Lap 14, losing third to Lewis Hamilton on his out lap before Valtteri Bottas emerged ahead from his subsequent pit stop. Drive of the day: Bottas turned in a super drive for his maiden podium, beating Massa to third with some great laps either side of the crucial first stop. Perez also deserves a mention for an superbly managed race for sixth. It was the team's sixth one-two of the season, and although they crossed the line 1.9s apart, both drivers were pushing hard until the final lap. At Turn 3 on lap 71 of 71 both drivers ran wide as Hamilton, who had started ninth on the grid, gave one last push in the closing stages despite both cars managing brake issues. Rosberg made one mistake at Turn 1 on lap 31, but it was not enough to upset his lead and the extension of his advantage to 29 points in the drivers' standings. After starting from first and second the Williamses put up a fight for the first two stints of the race, but their charge, led by Valtteri Bottas after the first pit stops, waned in the final stint. Nevertheless, Bottas took the team's first podium since its victory at the 2012 Spanish Grand Prix as the FW36 finally lived up to the promise it showed in pre-season testing. Felipe Massa took fourth place despite a late charge from Fernando Alonso, who lurked within 1.1s of the Williams towards the end of the race but couldn't make a move stick. Sergio Perez used an alternative strategy by starting on the soft tyres to haul his Force India from 16th on the grid to sixth, and even lead for a brief period before his first pit stop. Kevin Magnussen took a creditable seventh place finish in the McLaren ahead the highest-placed Red Bull of Daniel Ricciardo. It may have been a disappointing race for the home team, but Ricciardo gave the team's fans something to cheer about on the last lap when he produced the move of the race to pass Nico Hulkenberg around the outside at Turn 5. Hulkenberg finished ninth, continuing his record of scoring at every round, ahead of Kimi Raikkonen, who took the final point in tenth position. Massa held on to first place at the start of the race as Rosberg got a good start and beat Bottas into Turn 1. However, Bottas re-passed Rosberg into Turn 2 to give the advantage in the opening stint of the race to Williams. Hamilton, meanwhile, made a brilliant start from ninth on the grid and was fifth by the time he exited the first corner. Over the remainder of the opening lap he worked his way up to fourth by passing Alonso and filed into position behind team-mate Rosberg. After just two laps, Sebastian Vettel slowed with an electrical issue, putting him a lap down and out of contention. He retired on lap 36 after making contact with Gutierrez while fighting for last place, bringing to an end a thoroughly disappointing weekend for Vettel at Red Bull's home race. For the first ten laps not much more than three seconds separated the top four cars, although it seemed unlikely the Williams had the pace to stay in the running for victory. 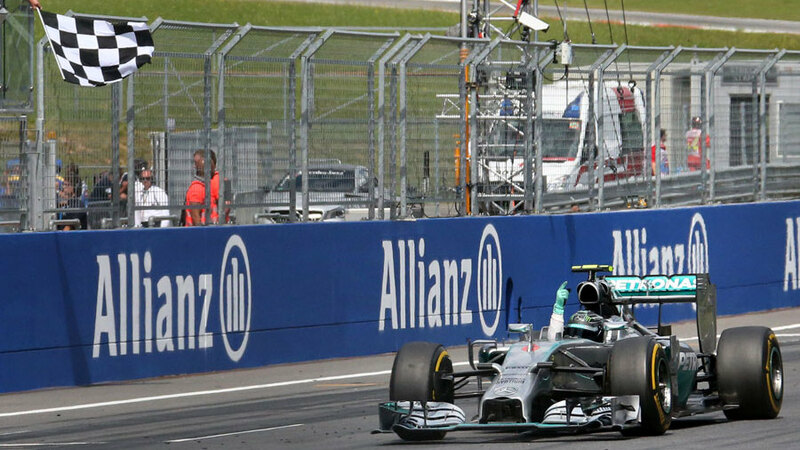 Rosberg upped the pressure on lap 11 by pitting first, allowing Hamilton to close in on the tail of Bottas. Hamilton then pitted on lap 13, but his stop was 0.9s slower than his team-mate and he resumed behind him. Williams responded by pitting Massa on lap 15 but Rosberg's quicker pace on new tyres saw the Brazilian come out behind the lead Mercedes and then get passed by Hamilton at Turn 2. Bottas waited until lap 16 to pit and by virtue of a slick 2.1s pit stop, he came out between the two Mercedes. He managed to hold off Hamilton for the remainder of the stint as Hamilton started to struggle with brake issues that would blight the rest of his race. Perez was actually leading the race at this point thanks to a longer first stint and he bottled up Rosberg, Bottas, Hamilton and Massa behind him. None of the four cars on fresher tyres were able to make a move, but were finally unleashed on lap 29 when the Force India pitted. Rosberg ran wide on lap 31 - his only major mistake of the race - allowing Bottas to close in, although not quite enough to make a move. Nevertheless, the top three held position until the second pit stops, which Hamilton kicked off on lap 39 followed by Rosberg on lap 40. Again, Hamilton lost roughly a second to Rosberg in the stops, but by the time Bottas rejoined from his pit stop on lap 41 the Mercedes duo had a one-two lead. Both Mercedes were managing issues with their brakes and Hamilton even had a lick of flame from his front-right wheel at his final stop. On the last lap the gap looked too big for Hamilton to close, but the pressure was clearly still on as Rosberg ran slightly wide at Turn 3 and Hamilton followed him through the corner with his car sliding sideways. 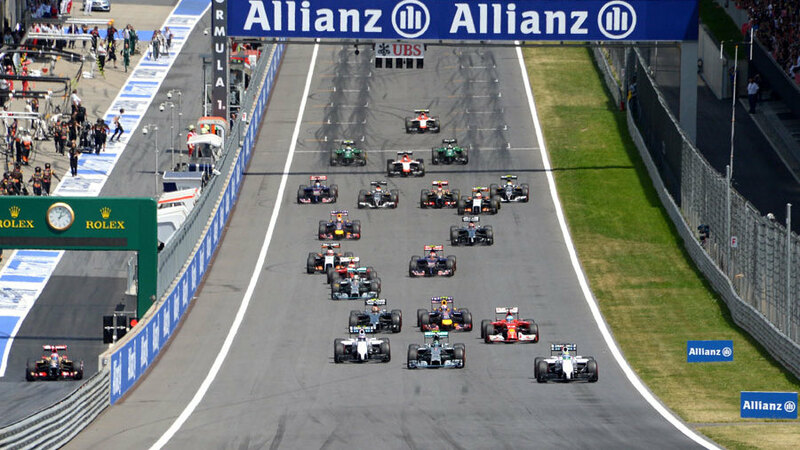 But by the time they exited Turn 9 for the final time, Rosberg had a lead of 1.9s over his team-mate and with it took his third win of the season.